If you’re trying to get out of debt or just starting to work on improving your financial situation you need an emergency fund. Here’s why you should start an emergency fund, how much money you need, how to save, and where you should keep that money. Also, as you’re reading through I want you to keep something in mind: your situation is unique to you. The amount of money you need, how you save, and where you keep your stash should be tailored to your personal circumstances. Without further ado here’s everything you need to know about emergency funds! 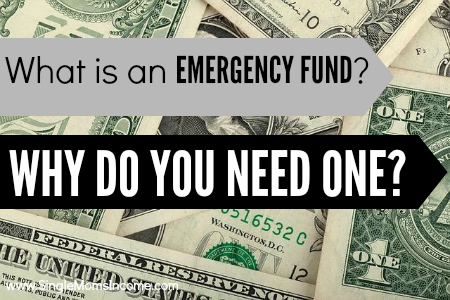 What Is an Emergency Fund and Why Would You Need One? New to the personal finance scene? If so, I’m glad to have you! Let me quickly bring you up to speed. An emergency fund is savings that you put back in the event of an emergency. For the sake of this post an emergency is something big and potentially life changing. You would need money to fall back on if you lost your job, needed to repair your car, or had a large medical expense, among other things. An emergency fund is cash you put aside for life’s inconveniences. It’s meant to keep you out of debt! 20 Reasons You Need an Emergency Fund. Looking for specific scenarios in which an emergency fund would come in handy? Read this post. Start an Emergency Fund This post covers all the ins and outs of emergency funds – how to start one, why you need one, and ways to save. There’s no golden rule when it comes to the amount of money you should have in your emergency fund. Financial experts recommend anywhere from three months to one year’s worth of expenses. The amount you need is dependent upon your personal situation and comfort level. Let’s look at some advice from others. Money Savings Goals for Single Moms In this post I suggest that single moms (this is actually true for any single person – not just moms) should have a years’ worth of bare bone expenses in an emergency fund. When you’re single you have no one to back you up! It’s all you. You need to be prepared. How Much Do You Need In Your Emergency Fund? This post from Man vs. Debt suggests that you should have a bare minimum of $1,000 in your emergency fund. I completely agree! You Need a Small Emergency Fund to Pay Off Debt. Lance from Money Manifesto go overs the reasons you need a small emergency fund before paying off debt. He suggest having anywhere from $500 – $1,500 stashed away, depending upon your expenses, before slaying debt. Should Your Job Dictate Your Emergency Fund? I believe it should. Some jobs are far more stable than others. For instance, if you’re self-employed you should have a much larger emergency fund than say, someone who works for a government agency. The problem for many of us (myself in included) is that it’s hard to save money on an already tight budget. However, I’m living proof that it can be done! Here are some posts that will show you how to squeeze some more money out of an already too-tight budget. 13 Ways to Save Money on a Low Income Dr. Jason Cabler lists thirteen smart ways to save money on any budget and even shares a tip for bringing in extra income. Funding an Emergency Fund on a Really Tight Budget. 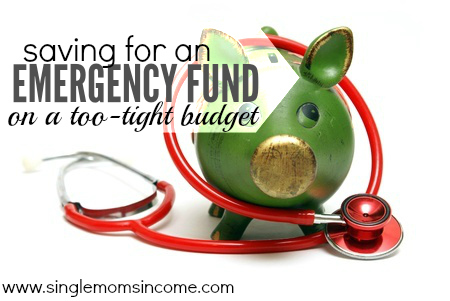 This post from Money Saving Mom gives some insight on what you can expect (the frustrations you’ll go through) when trying to fund your emergency fund on a really tight budget. Start a Side Hustle: 50 Legitimate Online Jobs Sometimes the only way to have extra money to save is to earn that extra money. Here are more than 50 legitimate work from home jobs you can consider. 5 Ways to Save Money – The Tough Love Edition Sometimes it’s you standing in your own way to financial freedom. (I’ve been there and still go there sometimes!) In this post Holly gives us some tough love and identifies five ways to really save. 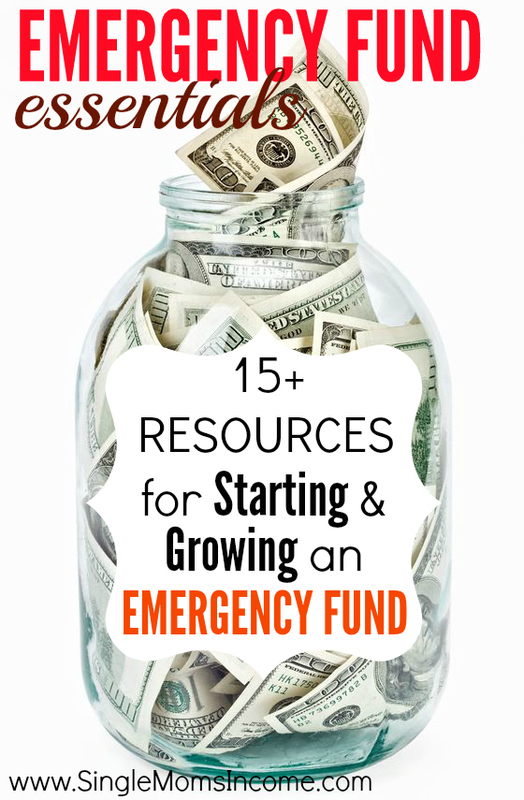 50 Tips for Building an Emergency Fund. This post from Consumerism Commentary offers fifty (pretty easy and very specific) ways to build your emergency fund. This is probably the most controversial part of the emergency fund debate. Some people think that you should keep your emergency fund money in savings, others say invest, while others go with certificates of deposits. Let’s get some insight on this matter from others. Keep Your Emergency Fund in Savings. Matt Becker suggest keeping your emergency fund in an online savings account. This keeps the money accessible but not immediately accessible. (There’s usually a 1-3 day wait when transferring the money to your regular bank account.) I agree with Matt and keep my eFunds in a Capital One 360 savings account. nvest Your Emergency Fund in I Bonds Want to get a little technical with the emergency fund interest? Harry shows us how to stagger an emergency fund in I bonds. Since you have to keep the cash you put in an I Bond for one year Harry shows us how to space out those investments. An emergency fund is pretty basic. It’s just cash for you to fall back on. You don’t need to do anything fancy with it. Just save it and let it sit in an online savings account. All that really matters is that you have that money set aside so that when disaster strikes you’re prepared! What are your preferences? How much money do you think should be kept in an emergency fund and where should you keep it? Great emergency fund post! I believe a good emergency fund is essential if you want to get out of debt and not to have to resort to credit cards ever again. It’s the way people used to do it before credit cards existed. Thanks for linking to my article Alexa! I completely agree. Anyone working to get out of debt absolutely needs an emergency fund! Wow, great round up post! This is really comprehensive for someone who wants to know more about e-funds – and even for people (like me) who thought they knew all about them! Thanks! No matter what, I am never comfortable with how much money I have in my emergency fund. It is like when you need it you just don’t have enough. I am continuing to add to mine. This was a great post about emergency funds. I also believe that a emergency fund can never be a one amount fits all. Your emergency fund should be tailored to your way of life. For some the fund should be $10,000 for some it could only be $1,000. Me personally due to living overseas away from my family, my emergency fund has to be more than $3,000 in order to purchase flight tickets home. Due to me trying to become debt free I have set my emergency fund to $5,000. See…that’s what I mean. Great post! Great round up of information! Thanks so much for including one from my site 🙂 I would like to have our e-fund at 3 months worth of expenses, but it’s a work in progress. I’ve found that a good basic “rule” for funding your emergency fund is multiplying 1 month of your essential living expenses by 3.